In seven seasons with Ostersunds FK, Oscar Friberg has seen his side progress more than he could ever have hoped. And yet the challenge of becoming a dominant side domestically remains, Ostersund won the title in 2021 but failed to retain it last year. Clubs in Sweden are growing consistently, with several Swedish sides reaching the Europa League knockout stages on a regular basis. 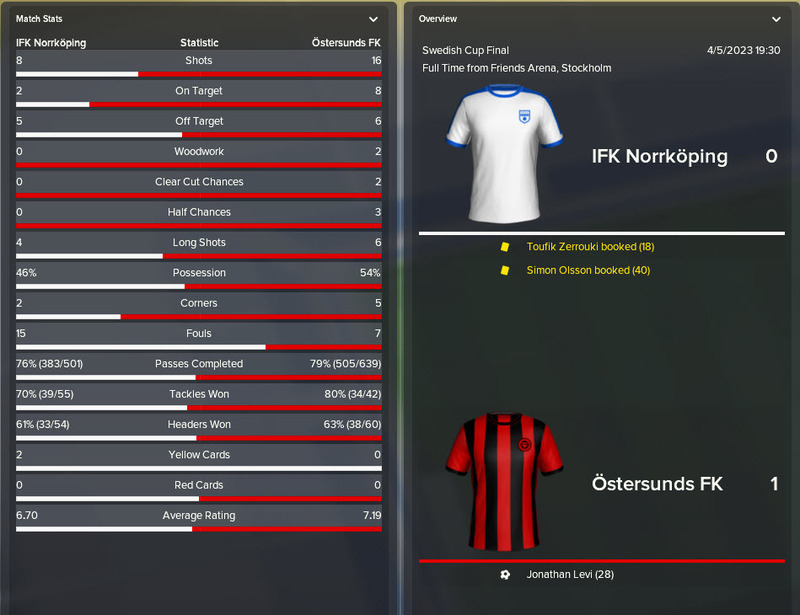 In this post we will take a look at how Ostersund have performed in the 2024 season. Can Friberg lead his side to a second title in two years? Will Ostersund finally win the Swedish Cup? How far will they make it in this years Europa League? This post will be the first in two posts in season seven. #7.2 will look in-depth at what is perhaps the greatest squad I have ever assembled on Football Manager, I love our squad! We’ll look at each player individually and see why they are so important to our side. If you want to catch up on any previous Ostersund post, do check out the link below where you can find all of our Ostersund posts in order, starting from our introduction. Let’s get into our season seven review. I don’t usually place too much emphasis on my signings in these posts, but I feel it’s important to show off three signings we’ve made this season to highlight the progress we have made as a club. If you enjoy seeing more about my players, the next post will be an in-depth squad review. Make sure you keep an eye out for that! In January 2023 we signed Rhian Brewster on loan for the season. The Liverpool youngster had spent time out on loan for the majority of his career so far and has scored plenty of goals for his various sides. He was our top choice striker for the 2023 season and he will be joining PERMANENTLY at the end of his contract in June 2024. Igor Papuga joined Ostersund from Sparta Prague for £2.5M. The wonderkid plays in our mezzala role and has certainly justified his price tag after his first season with us. He is likely to want to leave us soon but we’ll do our best to sign him up to a long-term contract – his current deal ends in 2025. Milan Pridham became our club record signing when he joined from MLS side Toronto. The young Canadian goalkeeper is considered a wonderkid and has shown throughout his year with us that he could become an incredible goalkeeper. These three signings really do show our progression as a club. The quality of the signings being brought in will only boost our reputation and help us to continue to grow. Now let’s get into our season review, how did Ostersund do with these three additional signings? Ostersund were drawn to play Dynamo Kyiv in the 1st Knockout Round after their dominant display in the group stage last year. After two closely-fought legs, Ostersund scraped through 2-1. We were then pitted against German side Hoffenheim. We’d actually played against Hoffenheim in the 2020/21 Europa League where we drew 2-2 and lost 1-0. This time out, with a much-improved side, I was expecting to progress through the tie. Unfortunately, despite a 2-1 advantage heading into the second leg, we fell apart and lost 3-0 which put us out of the competition. Last year we reached the Quarter Final and so the side are clearly disappointed to have lost out on another QF appearance. The Swedish Cup has been the most frustrating competition for Ostersund. We have reached the final in each of the previous three years but we’ve lost to Norrkoping on each and every occasion. This year, could we finally end this run of defeats to win our first Swedish Cup? We progressed through to the final once again. This year we beat AIK in the quarter-final and Malmo in the semi-final. And yes, again we were to meet Norrkoping in the final! We have finally won the Swedish Cup. A 1-0 win was enough to secure the win and give Ostersund their second Swedish Cup after their victorious effort in 2017. Jonathan Levi scored the winner, the Swedish winger has never been a first-team regular for Ostersund but he always seems to pop up at the right time and make crucial impacts when given opportunities. Ostersund last won the Swedish title in 2021. 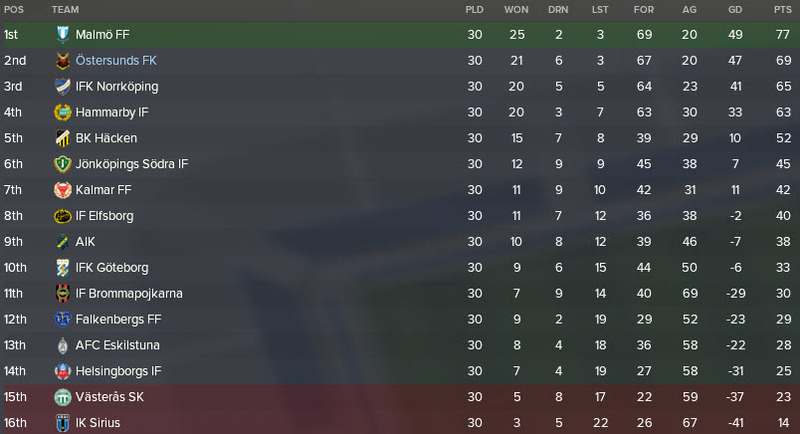 In 2022 Norrkoping proved too strong an opponent as they won the league by 10 points. Would this be Ostersund’s year to fight back and reclaim the title? Decent form throughout the season promised to help Ostersund challenge for the title, and indeed we were in the title race for the entire season. 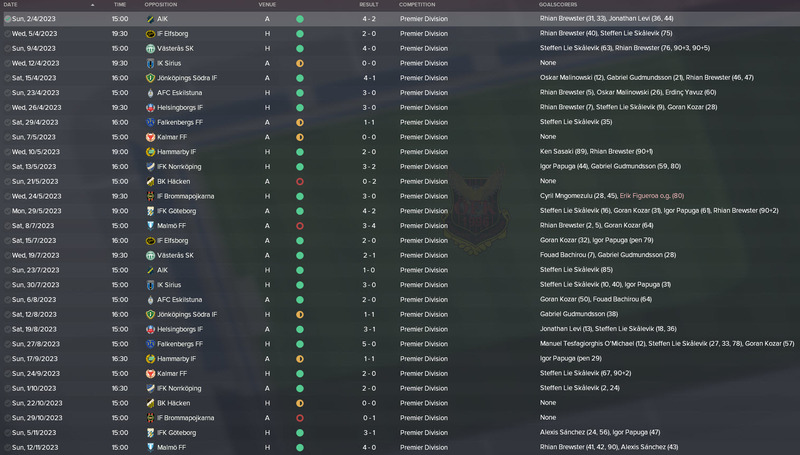 Two wins over Norrkoping was a highlight after their dominance last year (this only added to my glee after beating them in the Swedish Cup too). But it was Malmo who would be our title rivals this year. And in July we played against them at their ground in a title six-pointer. Incredibly, we led Malmo 3-0 after 64 minutes as Rhian Brewster netted two early goals before Goran Kozar scored midway through the second half. A win here would have given us the momentum to go on and win the title. Instead, we conceded four goals to lose the game and lose most of our confidence. To say I was furious is an understatement. 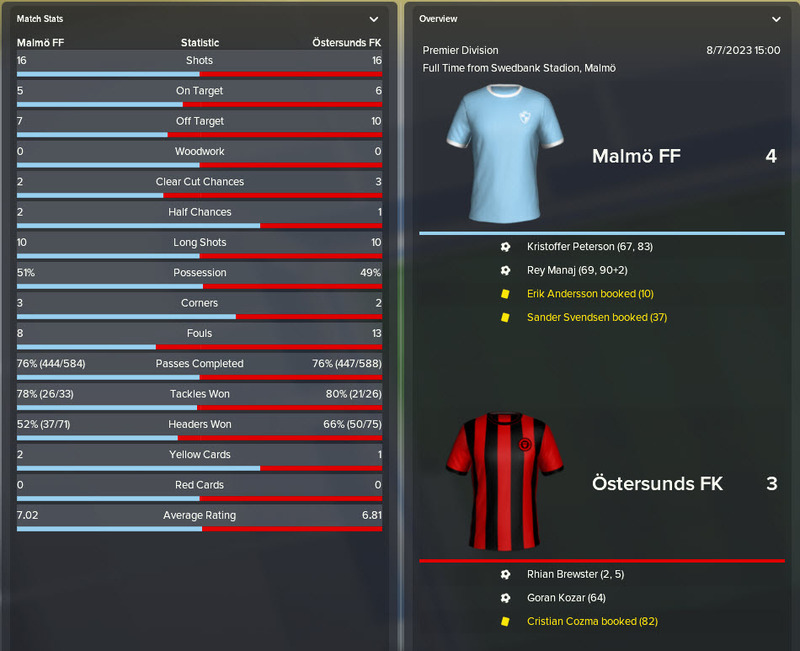 Malmo went on to win the league by eight points. The key factor was our 6 draws compared to their two. Our inability to punish lower-placed opposition was a stumbling block but that 4-3 loss to Malmo crushed our title hopes. Having said all this, 25 wins out of 30 for Malmo was a great effort. We’ll need to come back stronger next year. As a result of finishing 2nd last season, we were put into the 2nd round of qualifiers for the Champions League. We blasted our way through to the final qualifying round, beating Luzern and Zenit on the way. We came up against German side Wolfsburg and fell 5-2 over two legs. This meant that we would fall down into the Europa League group stage for the third consecutive season. This is really useful for our nation coefficient and should help us on our way towards increasing the number of continental places in the Allsvenskan. In our Europa League group we faced Spartak Moscow, Anderlecht and APOEL. As expected, we finished top and cruised through to the knockout rounds for the third time in a row. Unbeaten in the groups, dropping points only to Spartak Moscow, shows great progress and hopefully we can go on to reach the SF’s next year. I think these two signings really epitomise how far we have risen as a club. Both James Rodriguez and Alexis Sanchez have joined Ostersund and will most likely end their careers with the Swedish club. Two unbelievable signings! If you want to see more updates like this, be sure to follow my Twitter @VivaLaVidaFM. 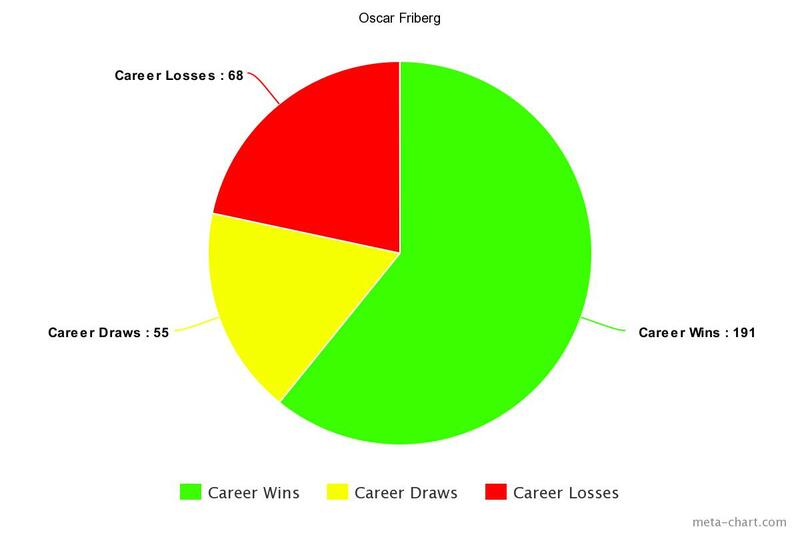 Oscar Friberg has had yet another impressive year that has helped to improve his managerial statistics. A 61% win rate in all competitions is very impressive and this is only going to rise if Ostersund continue their progression. Friberg will of course be downhearted with his performance for Sweden, will he take on the role again in the future to make amends? As mentioned earlier, the next post in this series will be a squad review and is likely to be one of my most favourite posts to write. I’ve fallen in love with this Ostersund squad and I’m loving the save so far. I hope you are enjoying following my journey too! Thank you very much for reading another instalment of our Football Manager 2018 story here on VivaLaVidaFM. Now two seasons without league success, we really must focus on securing the title next season. 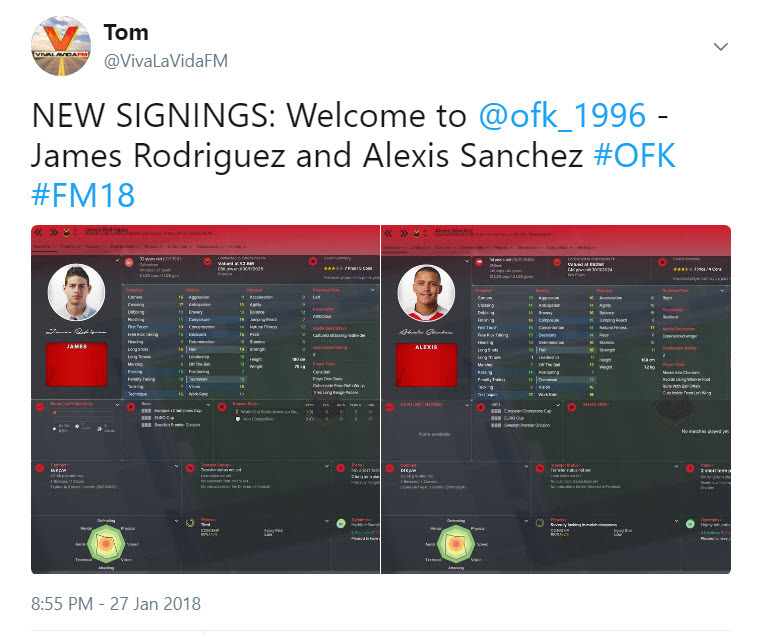 This entry was posted in FM18 Stories, Football Manager 2018, Oscar Friberg, Ostersunds FK | @VivaLaVidaFM and tagged alexis sanchez, europa league, europe, fm stories, fm18, football manager, james rodriguez, Oscar Friberg, ostersund, sweden, swedish allsvenskan, swedish cup. Bookmark the permalink.